Misty? No. Jade? Well it depends what light it's in! I've never seen a creme change so much depending on whether it's wet or dry, or what topcoat it's under, or what time of day it is. Weird! I think it's a really nice shade to have, and quells the For Audrey urges somewhat... if only it'd stay one consistent colour! Winter?? Where do you live? It's summer here! Anyway, this is a gorgeous color, and the gold glitter really makes it pop! Reminds me of the beach. Love the combo with the gold! Thats such a gorgeous colour, and even prettier with the gold ontop! Love it. I really like this combo! I wish we had those Rimmels here in the states! I love the blue and gold combination! By the pictures, it seems a tad brighter than For Audrey. Very pretty. Oooh I have that essence polish! I find it a little difficult to use because it's pretty thick, and I have to use quite a few coats to get that density of glitter. Did it cause you any problems? That's such a nice shade! Every time I see a golden glitter gradient I can't help but think...golden showers. Thanks to you lol. @Lynn - Thanks! 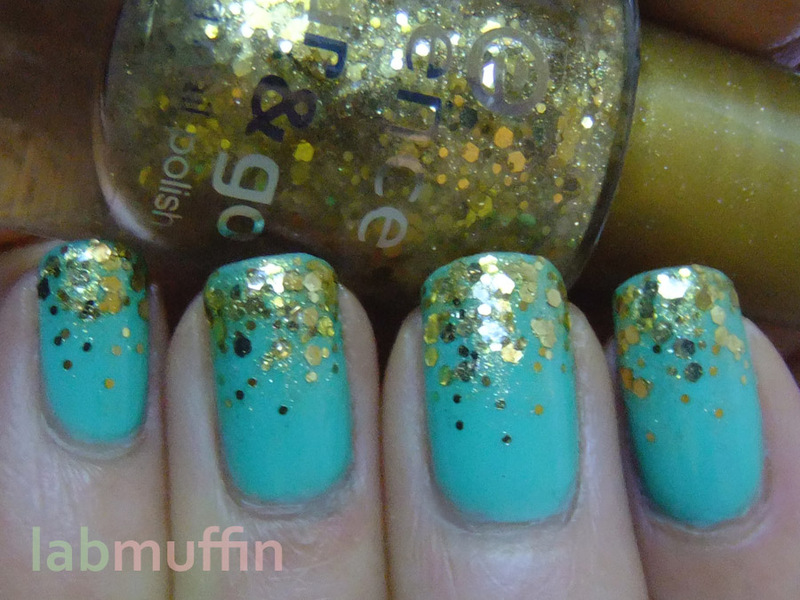 :) I'e worn it a bit too many times though, trying to move away from gold glitter gradients now... it's hard though! @The Nail Artiste - Possibly... I need to wear this to the CG store to check! @Em - It really is! I'm liking it more every time I wear it.